There have never been as many opportunities in our world as we have today. Yet, women and girls, in Latin America and across the globe, have never faced so many challenges when it comes to taking advantage of such opportunities. Women and girls often experience reduced access to technology, information, education opportunities and services, including health care. Globally, 62 million girls between the ages of six and 15 are not in school, and girls continue to lag substantially behind boys in secondary school completion rates. We are talking about 50 per cent of humanity that is being held back and this is a reality that affects all countries, some of which in the Global South faring much better than their counterparts in the North. Currently, the U.S. and Canada, for instance, show the highest percentages of women in professional and managerial roles at 39%. That compares to 37% in Europe, 36% in Latin America, 33% in Australia and New Zealand, and 14% in Asia. But by 2025, Latin America is expected to lead the world at 49%. Asia will double its representation and Australia and New Zealand is expected to climb to 40%. Europe and the US and Canada are expected to remain flat, making virtually no progress. Although industrialized countries spend more in health care, their health outcomes are not generally better either. Low socioeconomic achievement and poor development indicators, particularly in the area of health, can be found in poverty pockets within rich countries. Women and girls are the ones more directly affected, with reduced access to quality services such as antenatal and childbirth care, or even family planning. As we met in Chile last month, we talked about how gender equity is a goal and is also a big part of the solution. Think of what we can collectively achieve if women and girls are empowered, included, listened to. We are both examples of what women can accomplish when they have a healthy upbringing, quality education and are able to engage in civic participation. We are now trying to make a difference in the world, so that other women and girls can overcome barriers and beat the odds to reach their full potential. As heads of government, we set a precedent and became examples: one leading Finland from 2000 to 2012 as the first female head of state in the country, the other leading Chile between 2006 and 2010 as its first female president and then being elected for a second term from 2014-2018. It’s a bitter-sweet thought that in this day and age so few girls are able to grow up to become women in leadership. It is not that we are singular in what we do, but there are too few women who break the glass ceiling and actually have the opportunity to accomplish their goals. Human rights, including gender equity, are at the basis of development and precursors for health and progress. Empowered women can fight for their rights and make better, more informed decisions, especially those that affect their health and wellbeing, which in turn have an impact in their families and communities. This has the potential to create a virtuous cycle of prosperity. The UN Secretary-General, Mr. Ban Ki-moon, highlighted this nexus in the past decade and was a champion for women and girls, achieving milestones such as the creation of UN Women and the Every Woman Every Child movement. We trust that rights-based development for health and well-being of women, children and adolescents will continue to be a priority for the incoming UN Secretary-General, Mr. António Guterres. Personally, we strive to make this a key part of our efforts in the High-level Advisory Group for Every Woman Every Child, which fosters continued commitment and advocacy to end all preventable deaths of women, children and adolescents by 2030 and enable them to reach their full potential. We are proud to be part of the High-level Advisory Group, which is providing guidance to execute the vision of the Global Strategy for Women’s, Children’s and Adolescents’ Health. The Global Strategy—launched in 2015 as a front runner platform to help implement the Sustainable Development Goals—aims to transform societies by promoting enabling environments so that women, children and adolescents can realize their rights to the highest attainable standards of health and wellbeing. If we make this vision a reality, we can deliver a historic transformation that will improve the lives of generations to come. 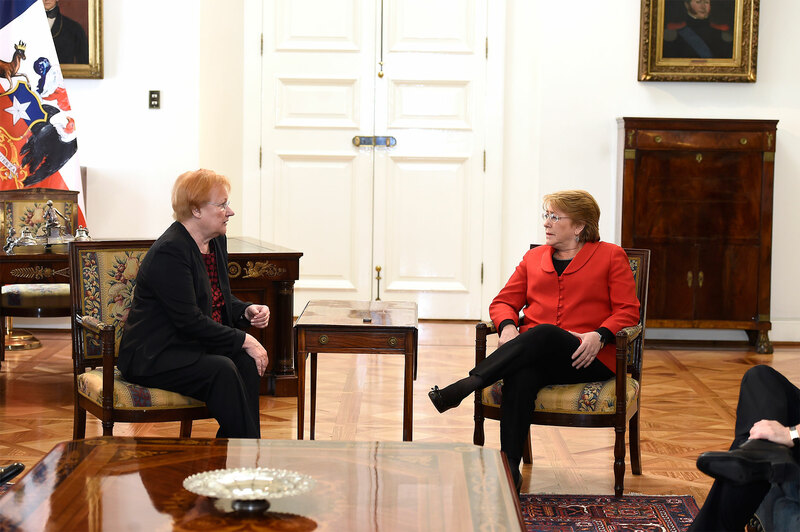 [Right] Ms. Michelle Bachelet Jeria, President of the Republic of Chile, is the Co-Chair of the High-level Advisory Group for Every Woman Every Child. [Left] Ms. Tarja Halonen, Former President of the Republic of Finland, is the alternate Co-Chair of the High-level Advisory Group for Every Woman Every Child. She is also Co-Chair of the High-level Working Group for the Health and Human Rights of Women, Children and Adolescents, co-hosted by the World Health Organization (WHO) and the Office of the High Commissioner for Human Rights (OHCHR).